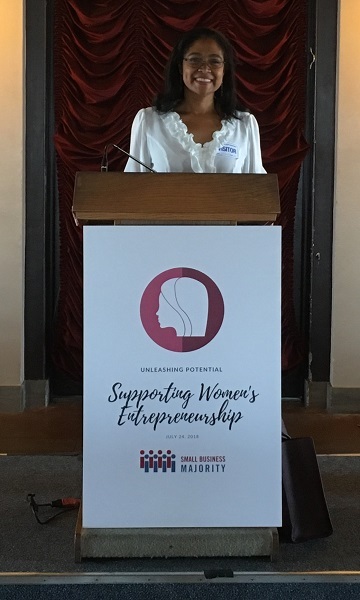 Recently I attended a women’s entrepreneurship workshop sponsored by the Small Business Majority. It was held on the 26th floor of the historic Los Angeles City Hall. It was a half-day conference that brought women (and some men) together to learn and share from one another. I personally had never heard of them, but now understand how important they are to the overall financial health of any company. The take-away message from the conference was that if you are considering becoming an entrepreneur, don’t got at it alone. Reach out! At minimum contact the Small Business Association’s SCORE program. This non-profit program is made up of industry leaders who have committed themselves to helping entrepreneurs learn, grow, and succeed in their endeavors. The service is absolutely free. Please contact them either through your local SBA office, or directly through their website. This really struck home because we often forget that those closest to us do want to support us, but often don’t know how. If you just need a few dollars, then they can do that for you. You just need to create a way for them to help you. You also cannot underestimate the generosity of strangers who are willing to give you a few dollars to help you reach your goal. Be mindful of the platform as well. For example, GoFundMe is usually saved for those in need of financial assistance for personal emergencies (i.e. ; funerals, medical expenses, etc.). This would not be a good platform for you to do fundraising for your company. Before you use crowdfunding, research what the different platforms specialize in. This will help get your campaign in front of the right people. In the end, being an entrepreneur can be a lonely endeavor. It is your attempt to bring something that has only lived in your dreams to life in the world. Know that there are people and organizations out there who are ready to help you for free. Let me repeat that…free! The apprehension you may be feeling is that no one will care as much as you about your idea. That may be true, but you need help getting this idea out to the world. Reach out, ask for help, do your research, and then go for it!